If you or your contractors can’t solve your cutting and drilling problems, we can help. We can cut and drill almost any material and we have extensive experience working in high temperature environments and in confined spaces. Difficult jobs are what we do. Extreme Cut Services is not your ordinary concrete cutting company. We are a cutting and drilling specialist. We have over 35 years’ experience in mechanical engineering in the manufacturing and construction industries in Australia, the USA and the UK. Being a specialist, difficult jobs are what we do. We have a reputation for thinking ‘outside the square’ and time and again have come up with efficient, innovative and cost effective solutions for even the most difficult jobs. View our About Us page for more information about who we are. We provide all forms of cutting and drilling services including: block sawing, wall sawing, wire sawing, core hole drilling (incl large diameter core drilling), magnetic drilling, stitch drilling, cigar drilling, thread cutting/tapping and line boring. We also modify and/or design and build custom cutting and drilling solutions, provide planning advice and problem solve difficult jobs. View our Services page for more information about what we do. We cut and drill concrete, reinforced concrete, refractory/AZS, steel, iron, zincalume, copper, glass, stone (sandstone, granite, marble, etc), masonry and brick for all infrastructure and construction structures. 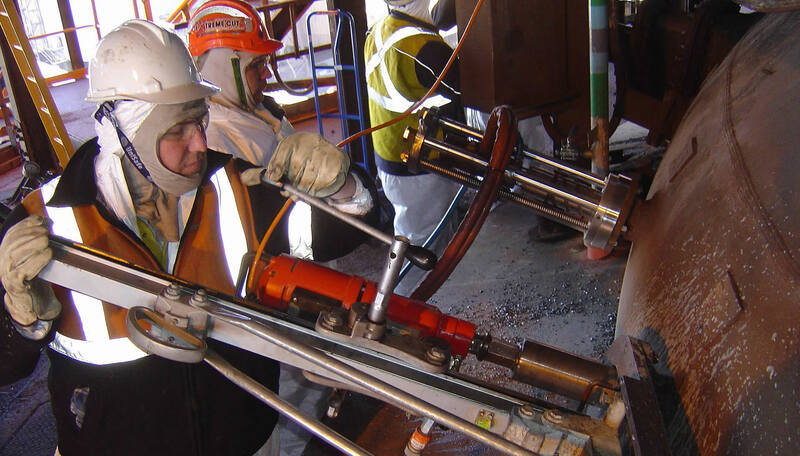 We have extensive experience working in high temperature environments and in confined spaces. View our Gallery page for more information about what we cut and drill and see photos and videos of our machines in action.